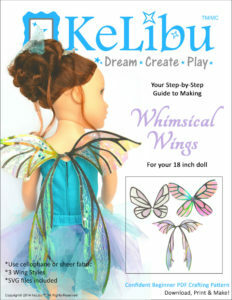 This digital doll clothes pattern will let you sew a captivating fairy costume for your 18 inch doll. 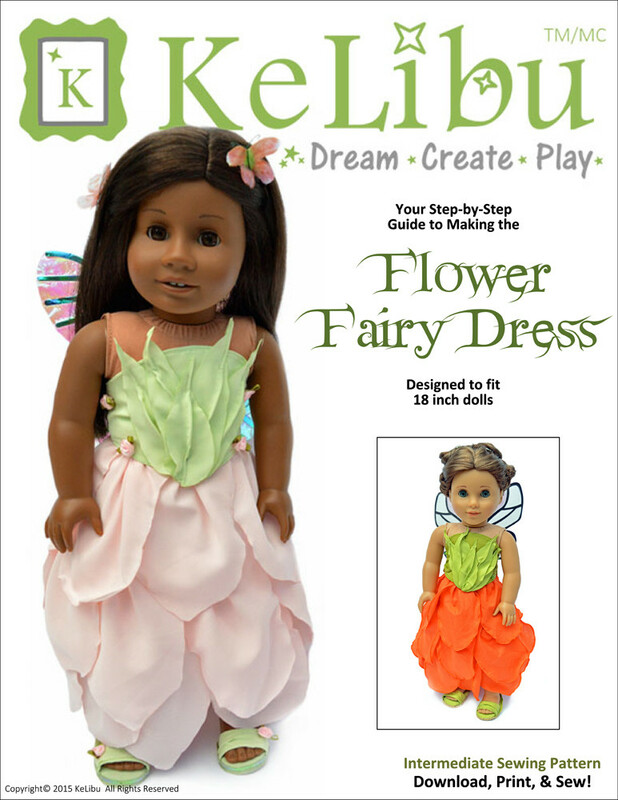 Every time a flower seed sprouts, a flower fairy is born! If you are quiet and still, you may be lucky enough to spot one of these beautiful fairies in the gloaming of twilight or the breaking of the dawn. 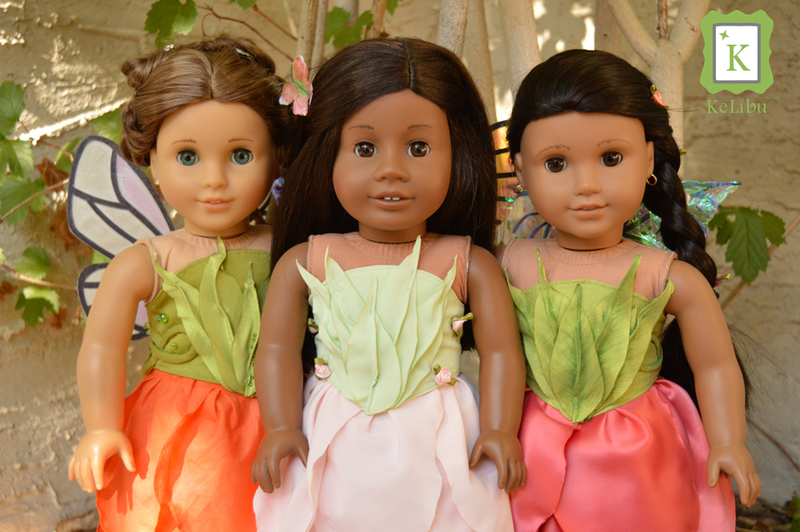 Flower fairies dress in leaves and petals that mimic the flowers they live in and watch over. This two-piece outfit captures the spirit of these alluring creatures with a skirt made of cascading flower petals and a bodice adorned with leaves and vines. This pattern may look intimidating but fear not! You can choose to work with natural fibres for the skirt, and hem the flower petals, OR you can choose the EASY method and use synthetics and heat seal them. Each provides a unique look but both produce gorgeous results. 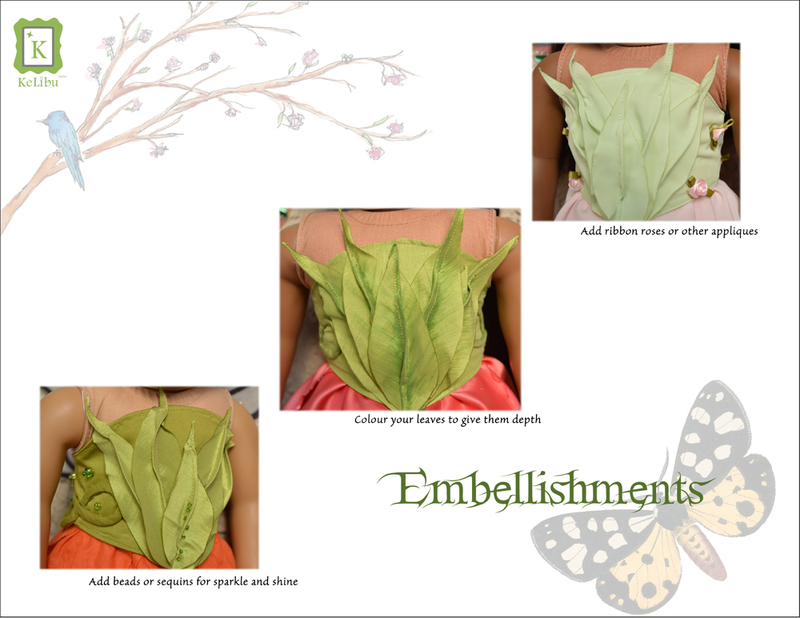 The easy heat seal method is also used on the bodice leaves. 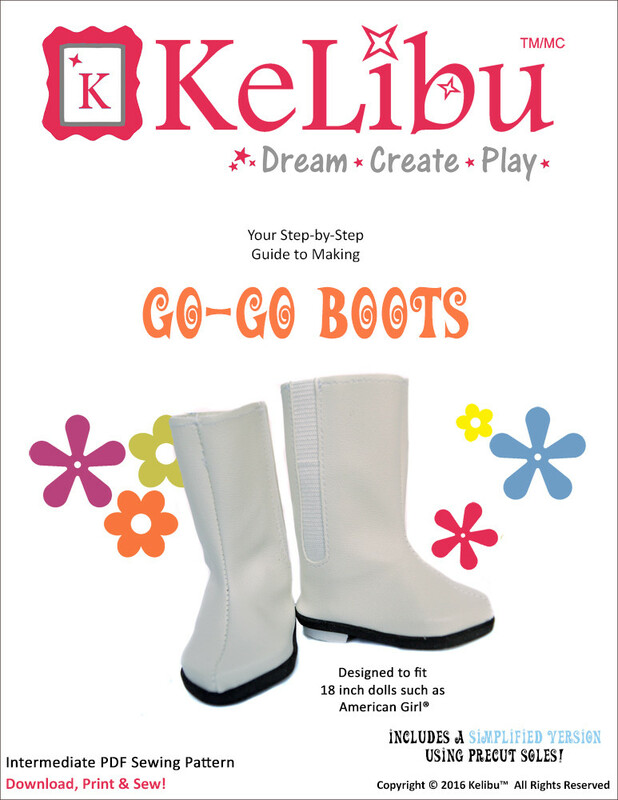 KeLibu testers were surprised by how easy the heat sealing method is. No hemming! – you just seal the edges of the petals and sew them on to the skirt. As an added bonus, the heat sealing method gives a nice, ruffled edge to the petals that mimics the look of real flower petals. 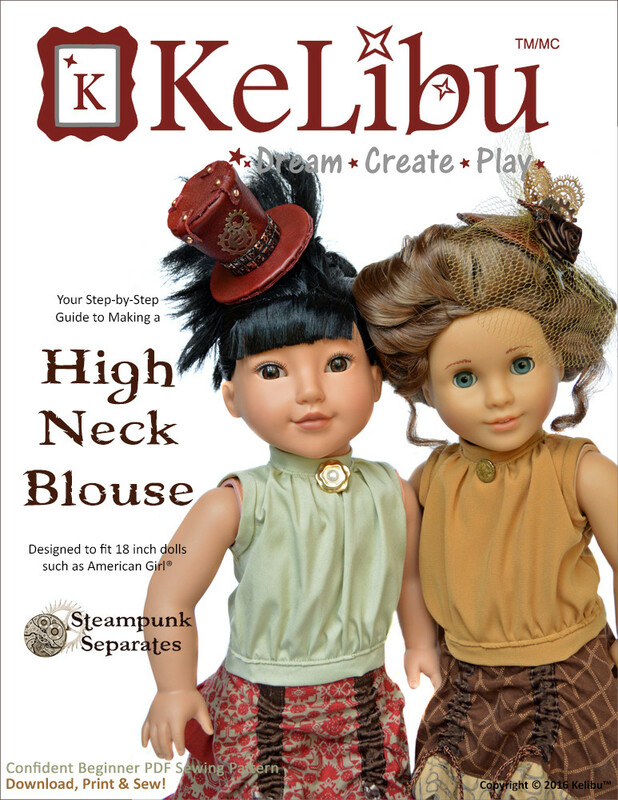 This PDF sewing pattern can easily be adjusted to fit 18″ dolls with waists ranging from 10.5″ to 11.5″. 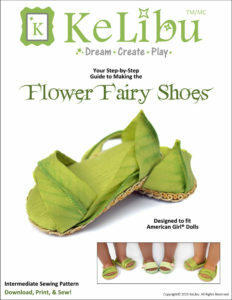 Check out the Kelibu Flower Fairy Shoes and Whimsical Wings patterns to complete the look! There are two fabric options for the skirt. 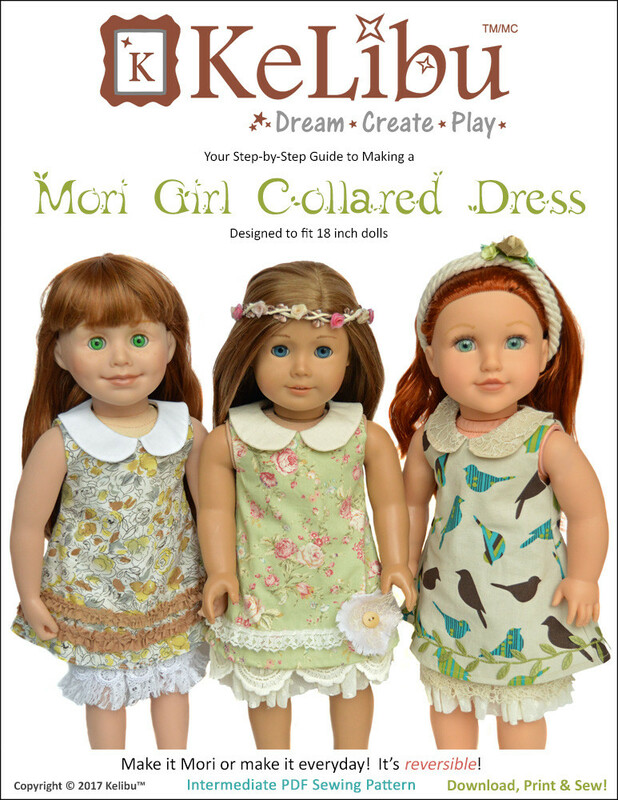 You may use a lightweight cotton or other natural fibre for the flower petals on the skirt. If you do, the petals must be hemmed. If you choose to use a synthetic fabric, you can choose to hem them or heat seal them. 0.45 yard/metre of cotton, cotton blends, polyester blends, taffeta, satin, crepe etc. for the Bodice, Bodice Lining and the Bias Tube Embellishment. A piece of lightweight fusible interfacing that is 10 inches long by 5 inches wide. I used a knit tricot interfacing but you can use your favourite as long as it’s not too heavy. 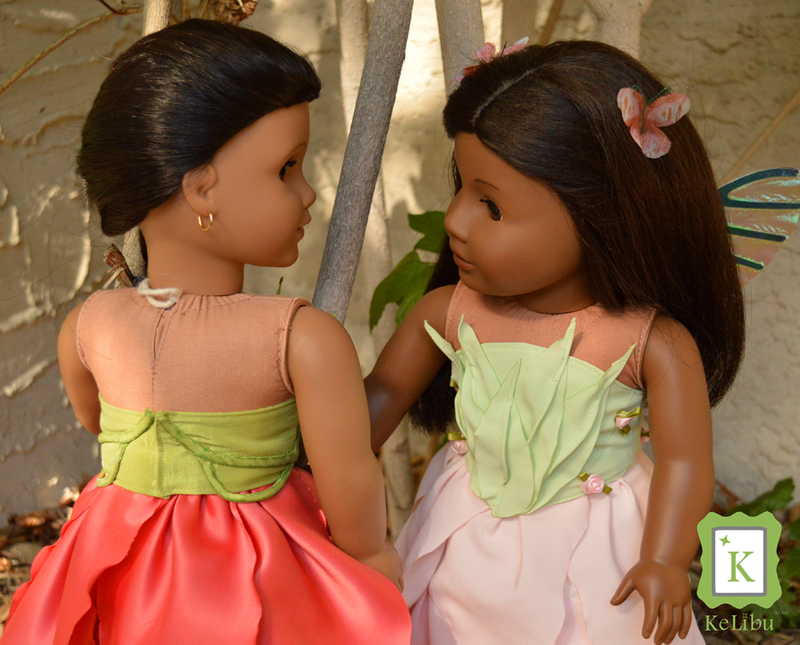 A 10 inch by 5 inch piece of synthetic fabric with a stiff hand such as taffeta or organza for the Bodice Leaves. 2 sew-in snaps or a piece of thin hook and loop tape that is 1 ½ inches long and 3/8 inches wide.